Hello. My name is Dina and I am slightly obsessed by names. Monikers, nick-names, tags and labels and everything in-between. (To be fair, I am obsessed with words. I am a word nerd. 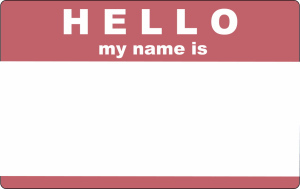 But this post is about names, so I shall stick to the subject, like a name sticker to its subject…). I am not even talking about the sociolinguistic importance of names and how they are perceived, both by ourselves and by others. It’s too early to delve that deep. I just like names.